The Young and the Restless (Y&R) spoilers for the next two weeks tease that love will continue to be complicated in Genoa City. The week of June 11-15 will bring some ups and downs for “Hevon.” Hilary (Mishael Morgan) will try to surprise Devon with a romantic dinner, but Shauna (Camryn Hamm) will get in the way. Fortunately, Devon and Hilary will have another shot at a lovely night. They’ll hit the sheets later this week, June 11-15, so it seems they’ll manage to keep Shauna occupied for a while. Across town, Abby (Melissa Ordway) will contemplate how things ended with Arturo (Jason Canela). She may believe she was too quick to shut him out. The Young and the Restless spoilers say Arturo and Abby will kiss eventually, so they may put their problems behind them. Elsewhere, Sharon’s (Sharon Case) history will come back to haunt her. As expected, Michael (Christian LeBlanc) will act like Sharon’s a terrible person and an awful influence on Christian (Jude and Ozzy McGuigen). Nick (Joshua Morrow) will explode at Victor (Eric Braeden) during the arbitration, but Brittany (Lauren Woodland) will urge him to get a grip. After the meeting wraps up, Nick will keep raging. The Young and the Restless spoilers say this war will spiral out of control, which could mean Victor will find himself holding the power. He may score custody or at least use his potential win as leverage. During the week of June 18-22, Nick will have a choice to make. It’ll involve his future, but what path is he headed down? Will Nick agree to work at Newman in exchange for time with Christian? Will Victor make Nick prove himself before he hands over custody again? Nick will have to answer some tough questions and make the best decision he can. Other Young and the Restless spoilers state that Brittany will get nosy. She’ll suspect there’s more to the story of J.T.’s (Thad Luckinbill) disappearance. Brittany will try to get some answers, so that’ll bring tense moments for Victoria (Amelia Heinle). Y&R fans know that Nikki (Melody Thomas Scott) killed J.T. and covered it up with the help of Victoria, Phyllis (Gina Tognoni) and Sharon. The cover-up crew should get nervous as more questions swirl. Victoria will feel like she has nowhere to turn, so she may spill her secret soon enough. Brittany could be the one who pries a confession out of her. Of course, there are plenty of other secret-keepers in Genoa City. Summer (Hunter King) and Billy (Jason Thompson) will ultimately keep one of their own. Summer may confide the real reason for her new attitude, which could bring some sympathy. There’s undoubtedly some sob story she hasn’t shared yet. Then again, this could be about some shocking new discovery. Whatever the case, it looks like Billy and Summer will leave everyone else out of the loop for now. 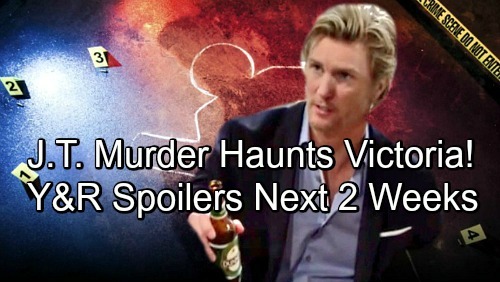 We’ll give you updates as other Y&R news comes in. Stick with the CBS soap and don’t forget to check CDL often for the latest Young and the Restless spoilers, updates, and news. The Young and the Restless Spoilers: Adam Newman’s Surprise Popup – Sneaks in for a Visit with Ailing Victor?